Giovanni Righi Parenti is my reference for Tuscan and especially Sienese cooking, perhaps even more than Artusi. Probably it is the fact that when I read his pages I recognize the accent of the chatter in Piazza del Campo, probably because you can find in his book recipes that are not actual recipes, but coded daily habit… In short, I trusted him and this year I will bring to our festive table an home made Panforte. This is the perfect ending to our Tuscan Christmas lunch with Cecchi Winery, isn’t it? Panforte is a thick and dense cake of medieval origin. At first it was made by the monks in the monasteries and given as a symbolic gift in special occasions, then passed into the hands of the apothecaries: sugar, almonds, candied fruit and spices were ingredients as precious as gold, and like gold they were kept from these figures that were a cross between an alchemist and a pharmacist, in huge glass jars on dark wooden shelves… I like to imagine their shops just like Ollivander’s shop in Diagon Alley, for those who are fans of Harry Potter. 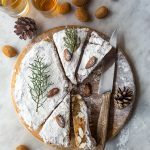 There are numerous recipes you can find to make panforte, more or less traditional, and the same Righi Parenti reports some of them. I took the short cut, and as in the case of cavallucci and ricciarelli I went to my usual shop in Poggibonsi, I patiently stood in line behind ladies in fur coat, young women and children with their eyes bewitched by all those sweets and when my turn to speak came I whispered the usual code phrase: I’d like a dose for panforte. A few minutes later I was driving home with a paper bag full of spices and other precious ingredients that filled my car with a distinct Christmas smell. As you can see making panforte is simple and the ingredients are quite a few and readily available. 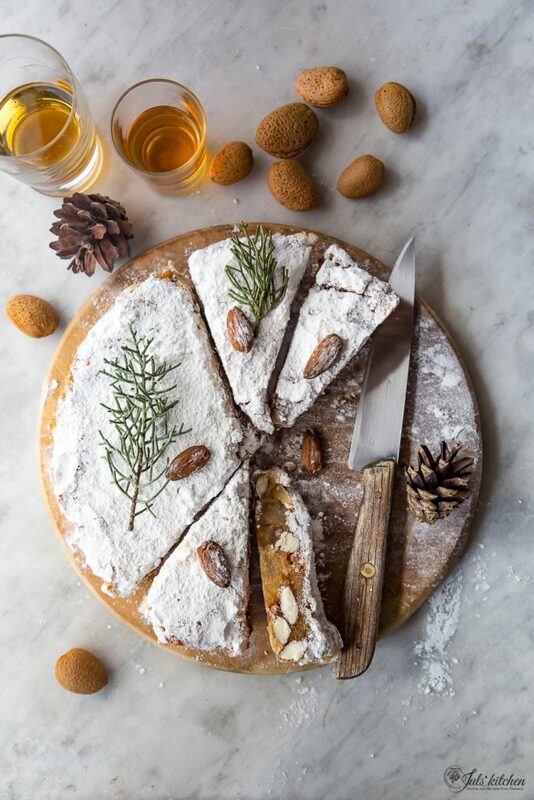 As in many traditional recipes the secret lays in the quality of the ingredients: crisp almonds that leave in your mouth a milky freshness and excellent candied fruit. Do not trust those boxes of candied fruit that can be found around at supermarkets, with the longest list of incomprehensible ingredients and a very little fruit trace. For once, treat yourself to a few slices of perfectly candied orange and cedro peel, or if you want to be even more precise and philological, candied melon. Line with the rice paper wafer a 18 cm round cake tin (preferably a springform tin, it will be much easier to remove the panforte once baked). * Panforte spices. 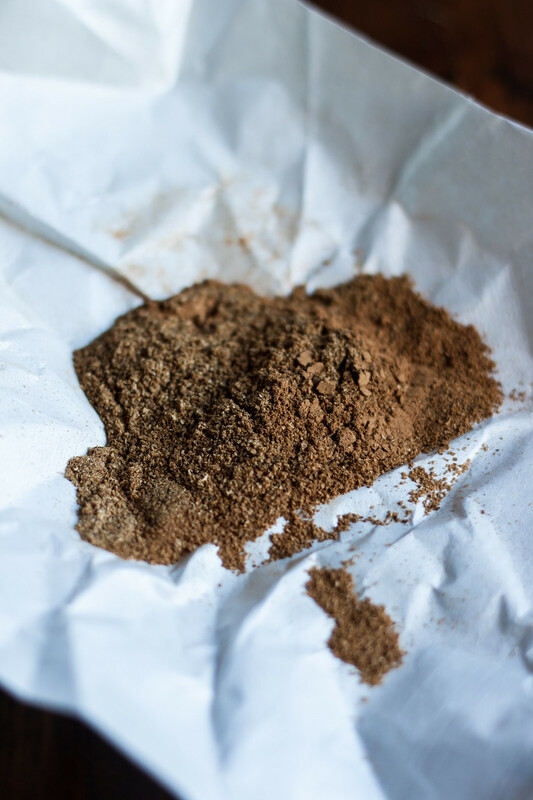 Every apothecary has his own secret mix, this is Giovanni Righi Parenti’s proportion: 5 g of coriander seeds, 3 g of macis, 1 g of cloves, 1 g of nutmeg. So this was the final cake, but this is not a goodbye… I’ll be back to wish you everyone a special Christmas! 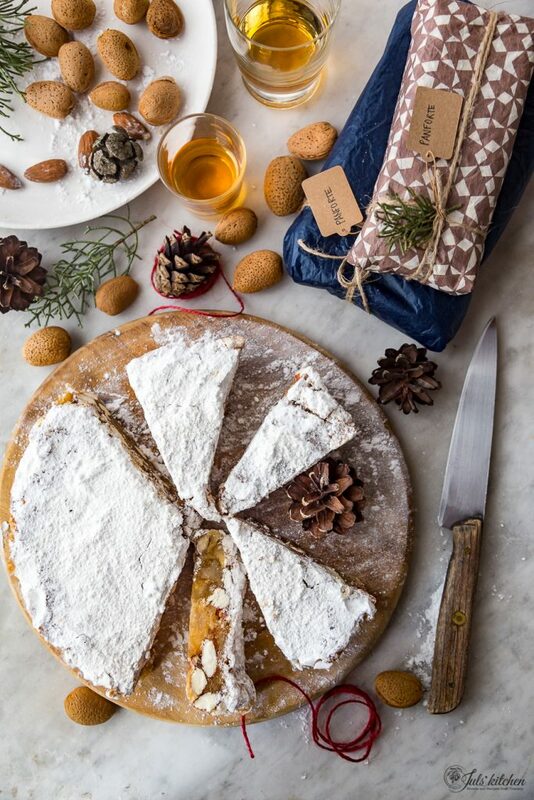 I so very much want to try your Panforte! I imagine it is so much better than the one from Nannini! Yours looks lovely and moist and I bet it’s so flavoursome. Together with an Earl Grey tea… perfect! That is a speciality I really love! Your Panforte looks amazing. Oh Giulia yours is so simple! The recipe I followed was so long! I will make yours soon, thank you for the lovely recipe and the memories of Siena it brings up! Panforte is forte! Great pictures, great taste, I am sure. Worth trying this, poor in sugars as well. This cake is lovely with the mosaic of sliced almonds and the deep spicy cake. I’ve never had it, but now I am determined to make it. I’ll have to make my own spice mix, though! I’ve never tried panforte, but I love the spices! This looks and sounds delicious, beautiful pictures as well. Happy Holidays! I would definitely love a slice of this Panforte! It’s absolutely gorgeous! Thanks for mentioning my recipe, Juls! 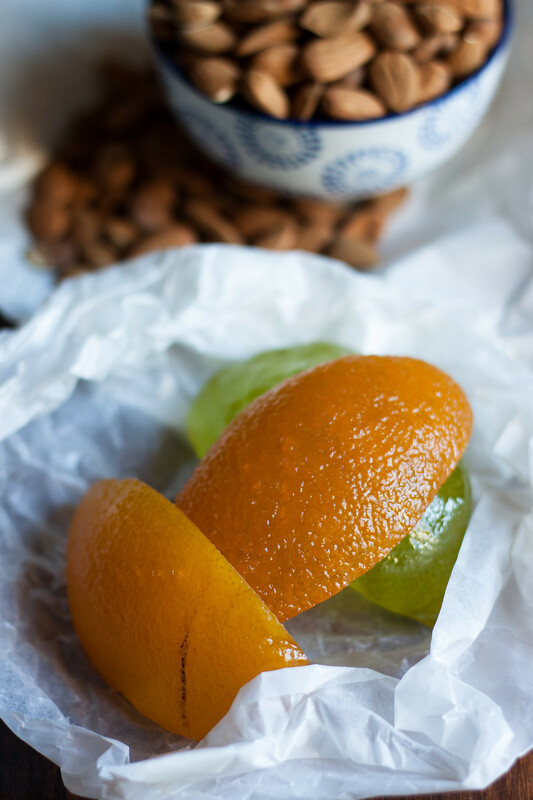 That beautiful, artisan candied fruit makes such a difference! One could find various recipes for Panforte but it would be nice if you list the exact spices you use. YO cna find the spices at the bottom of the post: 5 g of coriander seeds, 3 g of macis, 1 g of cloves, 1 g of nutmeg! 🙂 Let me know if you try it! This looks wonderful. I would like to begin now baking for several upcoming occasions. Can it be frozen? Actually you don’t need to freeze it, as it keeps well for weeks and months! just wrap it in waxed paper or aluminium foil… everyone will love you! Hi Giulia, is the rice paper you use the same kind as you can buy in Asian stores (and use for spring rolls)? Or should I use baking parchment cut to size? If you cannot find this one, parchment paper would work perfectly, though you’ll have to peel it off before eating the panforte! Thanks Giulia! I’ve had a look around & I now know what you mean… the paper is what’s called Oblaten in German, but it’s not really used here in Poland; I’ll have a look in the stores when I’m next in Austria. Meanwhile, I’ll just use parchment paper. BTW, can you eat the panforte straight away, or should it be left for some time to mature/soften? I know it can keep for a long time, but… does it have to ;)?